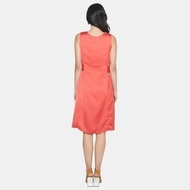 A classic shift dress crafted with a luxurious light-sheen fabric. Natural shell buttons adorn the dress, visible only on the top two buttons of the hidden placket. The belt sash can be worn at two positions - wear it loose for a comfortable, airy A-line fit, or tighten it to hint lightly of a waisted silhouette. Front slits allow for ease of movement while adding a tasteful elegance to the dress. UK 6: 1/2 Bust 16.5", Length 39.2"
UK 8: 1/2 Bust 17.5", Length 39.3"
UK 10: 1/2 Bust 18.5", Length 39.4"
UK 12: 1/2 Bust 19.7", Length 39.6"
UK 14: 1/2 Bust 20.9", Length 39.8"